Ellis grew up and was educated in New Orleans, a city known for its rich African-American heritage history. A city full of style, and artistic exuberance. This backdrop inspired Ellis to capture the essence of the subjects of his childhood in the glory of their rich cultural heritage. Extremely dedicated to his craft, this artist draws on a style that was born in his childhood from impressions of his native city. Ellis is self-taught and boldly blends realism and impressionism in his work, evoking nostalgia and inspiration. It's not folk art, but "Tedism", his own unique style of art. The art of this man both reveres and celebrates the traditional values of his culture. African-American culture and lifestyle is a vital part of the tapestry of American history. Ted Ellis captures that lifestyle on canvas, the man, lives the life he paints about. He is cementing himself in history as one of those Famous African-American artists you so often read about. 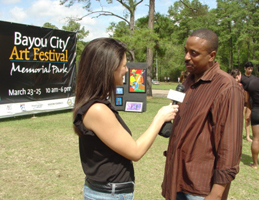 Ellis’ involvement in the community as an art advocate and educator has earned him recognition from numerous organizations and city officials. Ellis’ latest exhibit entitled, “Capturing Our Culture And Heritage” encompasses the diversity and cultural similarities of all Americans. This exhibit is planned travel across the country, visiting Chicago, New York, Mississippi, and New Orleans, and many more cities. Some of Ellis’ previous national exhibits include: “The Civil Rights Movement”, “Buffalo Soldiers”, and “Born In The Spirit”. T. Ellis famous African-American paintings has also been featured on local and regional television programs, in magazines such as Upscale, Southern Living, and Newsweek, and is frequently featured in newspaper articles throughout the country. His artwork may also be found on CDs and books.